Lisa's arm reached through the glass of a door she'd just broken through in an attempt to turn the doorknob. She stumbled across a lifeless body after trying to apologize for breaking and entering. She was hungry and was in search of food for herself and her young brother, Todd. There was nothing but dust, that body, and a letter sitting on a desk. Well, there were maggots in the wastebasket and a sour smell emanating from the fridge if you want to add that to the mix. The letter was curious, but really nothing to her. A Mr. John Williams had written to his son. He was describing the virus that has spread around the world claiming, "It's the worst in history" and that it was "not fatal to children under the age of about 12 years." Yes, but would it lay dormant until they got older? There was no time to think about the possibilities because Lisa Nelson was simply concerned about surviving. Her eyes lit up when she found a can opener. She hopped behind the wheel of a car, hoping she could remember how her dad drove it and was off to find seven-year-old Todd. It was hard to find food and keeping it was dangerous with gang activity. The Chidester gang was a "bunch of hungry kids who think they can bully people." They were smart, but not as smart as Lisa. Even though she promised Todd he'd be fine, they'd attacked him and stole his food. Tom Logan was behind this mess and he was enlisting other kids to steal for him. It would have to stop! Lisa scoured the Grand Avenue finding the "same story all over the neighborhood." Logan and his gang were enlisting kids to steal for them, holding them hostage with little to eat until they did his bidding. She had to figure out how to take care of all the children, while learning how to protect them. She had to use her head and soon found guys like Craig and Charlie to help her. Lisa had found a warehouse full of supplies, but she needed to form a militia to protect them all. Her new city would be called Grandville, but they'd hardly begun to organize when flames began to climb to the sky. Would they be able to fight the gangs? Could they protect the young children? Would they even be able to survive? This is an amazing apocalyptic tale of survival...survival of the fittest. The fittest in this tale were all young males around the age of 12, but an amazing girl, Lisa, gave them a run for their money. A disastrous plague had overtaken the world, a world that soon found itself without a single adult. I found the tale to be powerful, intriguing, and hard-hitting as it posed an interesting question...could children actually survive if there were no grown-ups to help them? 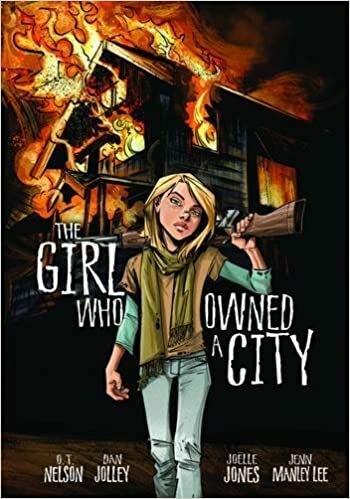 No spoilers here, but I was mesmerized with the action as Lisa Nelson struggled to find a secret hideout to create a city where the innocent and weak could survive. This tale, set in in a graphic novel format, had exciting (and sometimes dark) panels that matched the high drama of the tale. Quill says: If you have a young reader who likes anything dark, apocalyptic, and gripping, this is one tale you should add to your list!